Last edited by olskool on Tue Jun 18, 2013 5:37 am, edited 1 time in total. Grats, nice one, good eating. Olskool, I use that exact 32 rem. Loading in my 3 m-8 s -32 Cal. For deer hunting. Congrats on your kill. I always try to shoot a young dumb one first for my meat deer, here in Iowa. Although we have the ability to get multiple tags, some states may not have that choice. We can only get one shotgun slug buck tag though. We can't shoot bucks with a rifle here. Once again I congratulate you on your rifle kill.we can't use rifles until Jan. 11-20. Then it's only does in the lower 2 tiers of counties where I was raised and still own land. well hold on to your remington! here in sc on private land we have the longest deer season in the world. from aug 15-jan 1 limit on bucks is 2 per day no total limit. we also need no tags at all. we have 12 days that you can kill does with no tags. if you want you can buy 4 tags for does so you can shoot 4 extra. we can use any gun other than 22 rimfire, and that has been done many million times anyway. on private land there is no split season for guns, bows, ect. just hunt how you want. they also allow hunting with dogs, it has always been a tradition here in the lowcountry of sc. but i don't hunt that way. 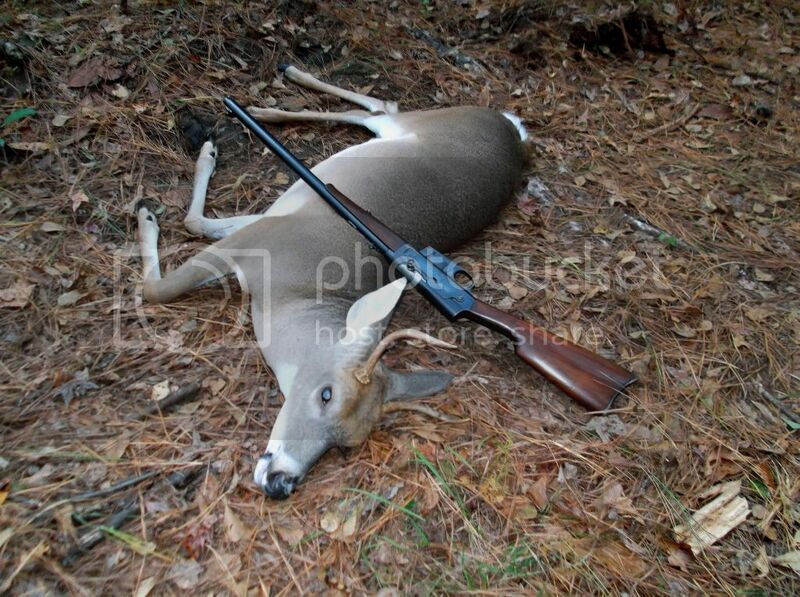 i kill about 7-10 deer a year. i have killed 6 this year, so i get to test a lot of my handloads in a lot of different guns. man it's great bein a redneck here in sc clinging to my religion and guns! Nice buck for the freezer. Were I live in Ontario the gun deer season is only two weeks long, it starts tomorro (nov 5) .The limit is one deer a season and there is a lottery for doe tags. With some luck my model 8 in 35cal will be used. Good hunting. Oskooll, it sounds like a great dnr you have there. Our Iowa DNR isn't very progressive.We're about the only state here in the central part of the country who doesn't allow gun hunting during the rut. Shotgun#1 starts on the first weekend of Dec. Then shotgun#2 starts on the second weekend of Dec. First season is 5 days long and second season is 9 days long. Only shotguns pistolsand muzzleloaders. No rifles til Jan. As I explained before.we are the second place state for road deer kills,yet DNR basically clings to their WW2 era rules. I was told by their director a couple years ago,that it's all about tradition.He wasn't even from Iowa, he was hired from Minnesota. What the hell he knows about Iowa traditions is beyond me. I don't know one'person here who doesn't want more dead deer. My farmer friends down home just tell'me to kill them all and they'll go buy more tags if needed.The crop destruction they do'is massive. roger maybe you can get a move started to change things. i would point to states like mine, our season is long and the deer population is still very good but in control. also i would contact the insurance companies, they have to pay the claims. who knows? maybe you can get some momentum started in the right direction. Hey olskool, thanks for your input on that subject.I'm self employed, so'i don't always have much extra time. However ,I seem to make time to post stuff on here ,don't I? It's always easy to complain,but not so easy to do something about it. Maybe it's time for me and my friends to put up or shut up. Your insurance Co.idea is a good one.God knows, Des moines is full of insurance companies.Our problem I sthzt our DNR board sets all the rules.It's mostly made up of non hunters/gunners appointed by our r governor. Then any rule changes must be approved by the legislature. House then Senate( democrat ruled) then signed by the governor.We just got our first dove hunting season after 70 some years without one.Maybe now is the time. Awesome picture olskool! I love to see guys still using these old "springpoles" 106 years after their inception! yea i still use it, it still works on deer or outlaws...i am going to put out corn this morning and i am taking it with me.